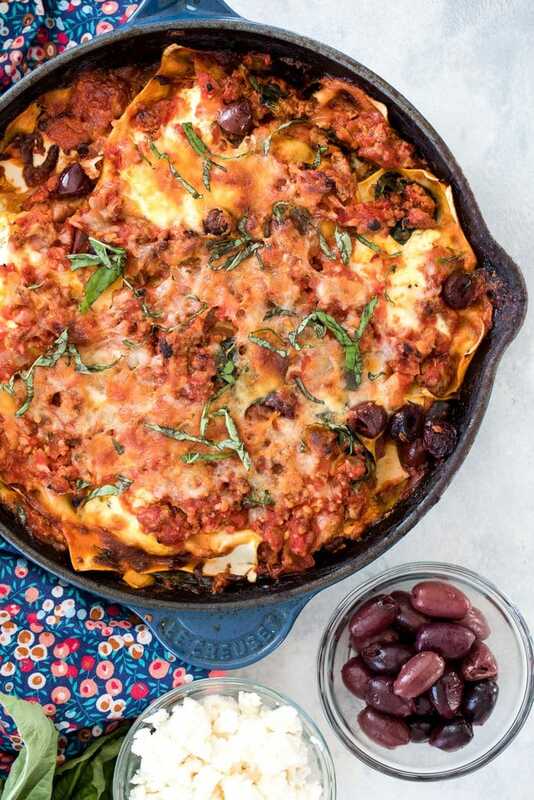 This Greek Skillet Lasagna is packed with Greek flavors, including ground lamb, feta, and kalamata olives, for a fun and easy-to-make (and cleanup!) twist on traditional lasagna. It may only be February, but here in New England, we got an amazing sneak peek of spring yesterday. It ended up hitting 74 degrees in Boston, which is absolutely unheard of at this time of year. I took full advantage of working from home and though I spent much of the day in the kitchen, I also sneaked out for some play time with the pup (does it bother anyone else that “sneaked” is correct grammar, but it sounds sooo wrong??). We ended up going on a short run, which felt amazing. I tried to do the same thing again today, but now that it’s 35 degrees, I just couldn’t handle it. I wouldn’t call myself a “runner” by any stretch of the imagination, in large part because I am not good at running in less than ideal conditions. And today’s conditions were less than ideal. When it’s too cold, my ears start to absolutely kill me to the point where I want to curl up in a ball on the side of the road. But also, when it’s too hot, my asthma acts up and I can’t breathe. Yesterday’s 74 degrees with a light cool breeze was perfection. Though I think yesterday was a mean little tease from Mother Nature, it’s not all bad that the temperatures are falling once again. I like to look on the bright side and frankly, I’m not done with cold weather comfort foods just yet. I’ve recently become obsessed with skillet lasagnas because of how easy they are to make (with minimal cleanup) and how many leftovers they provide for the week. Lasagnas just aren’t the same in the summer (though I’m dreaming of a lighter summer veggie lasagna now! ), so I’m going to get my fill in while I can. If I’m not out running, I may as well be inside eating lasagna, right? 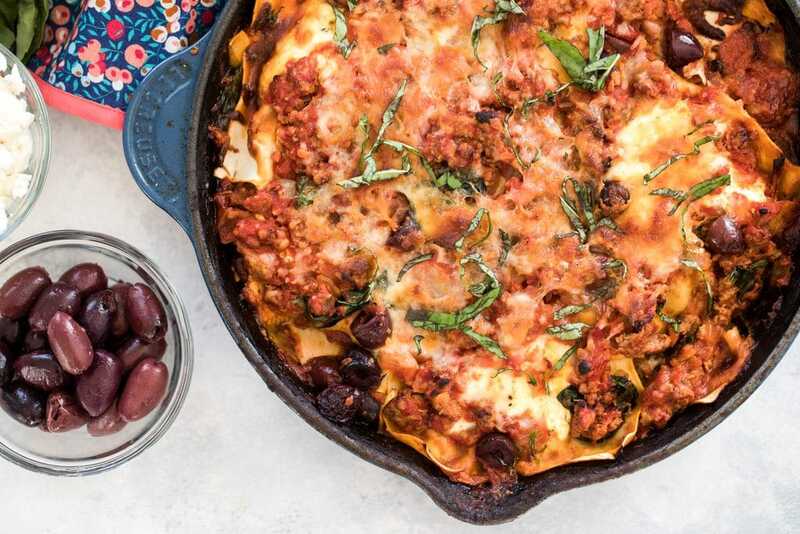 Greek food is one of my favorites and I couldn’t stop dreaming about how good Greek flavors would be in skillet lasagna form. Google “Greek lasagna” and you’ll find a ton of results for “pastitsio,” which is literally how Greeks make lasagna. This isn’t that. 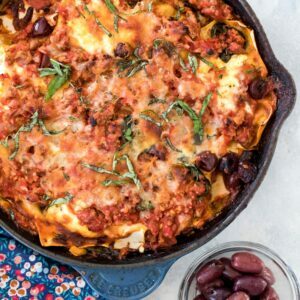 It’s an otherwise “classic” skillet lasagna, but made with Greek flavor combinations, like lamb, feta cheese, kalamata olives, and oregano. I think lasagna making scares a lot of people. But this skillet version is very simple and won’t have you slaving over the stove all day. You’ll simply need to brown ground lamb with onion and some spices and combine it with crushed tomatoes. And mix ricotta cheese with feta cheese. 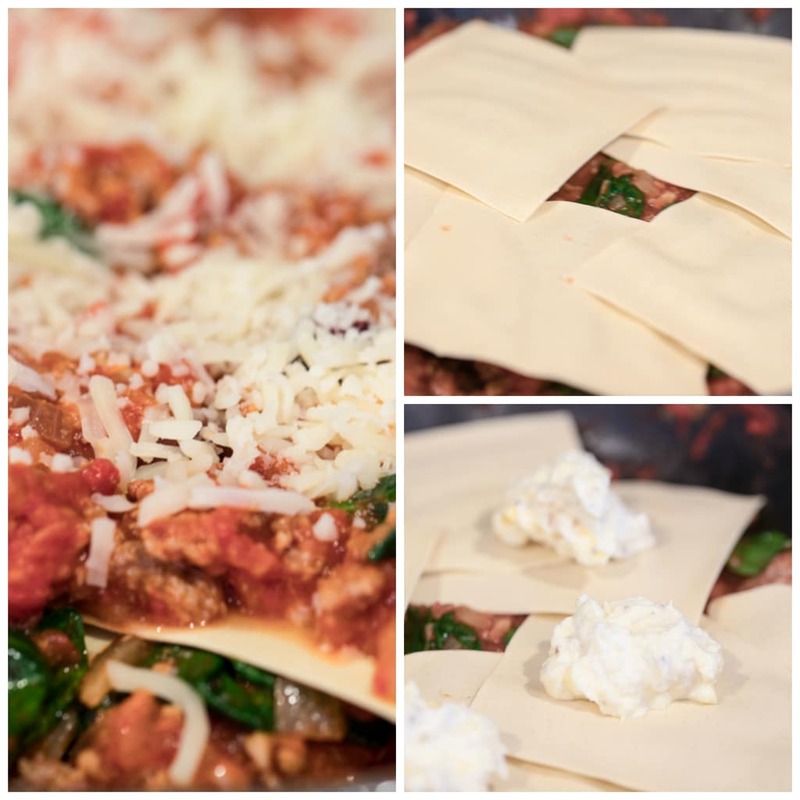 Mix in some spinach and kalamata olives and then layer the lamb sauce with lasagna noodles, mozzarella cheese, and the ricotta and feta mixture. Of course, you can make your own lasagna noodles, but since one of the best parts about this dish is how quick and easy it is, you most definitely don’t have to. 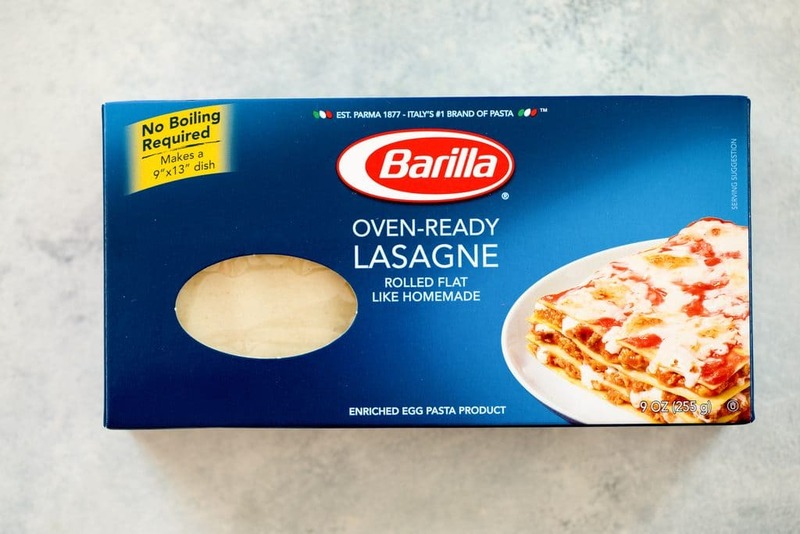 You can use any no-boil lasagna noodle, but I have to say I’ve been really obsessed with Barilla’s Oven-Ready Lasagne noodles lately. They’re “rolled flat like homemade,” which makes me happy. You only actually need 6 noodles for this whole dish. The focus is really on that delicious lamb sauce and the flavors from the feta and olives. I made this Greek skillet lasagna before Chris went out of town last week and ended up eating it for a few nights while he was gone. 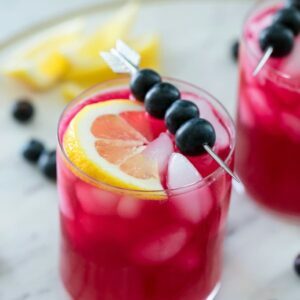 It was so nice to just go to the fridge, grab a slice of this, and enjoy it with a green smoothie (ok, or maybe a glass of wine) while watching absolutely anything I wanted on TV (I miss my husband dearly when he’s away, but this is one perk!). I made this lasagna in a 10-inch cast iron skillet because that’s what I have, but if you have a 12-inch, you can simply increase ingredient amounts by about 25%. Despite popular belief, you don’t have to have perfect proportions with lasagna. This one is definitely a little more meat-heavy than it is noodle. But if you want to use less meat and more noodles, that will be fine! I love my Le Creuset 10-inch cast iron skillet (currently on sale at Nordstrom with this affiliate link!). 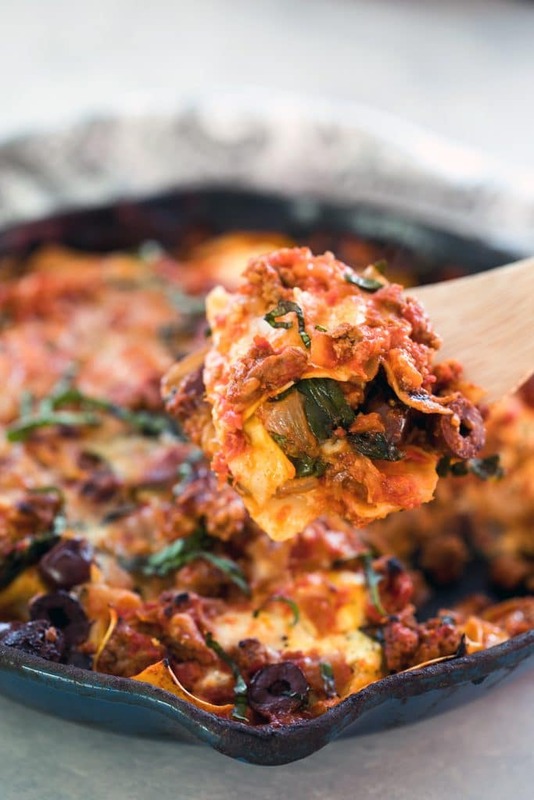 I love that this skillet lasagna is different than the typical lasagna, but just as comforting and satisfying. In addition to altering measurements, if there are any elements in this dish you’re not a fan of, you can easily leave them out. I know a lot of people don’t love kalamata olives and while they add a fun umami to the lasagna, it would also be delicious without. You may just want to add a little extra salt into the dish. You can also feel free to add anything in that’s not listed in the ingredients. I tossed in some spinach for a little extra nutrition, but you could always add kale or another green. And if you don’t love kale, try this lasagna with turkey or beef! 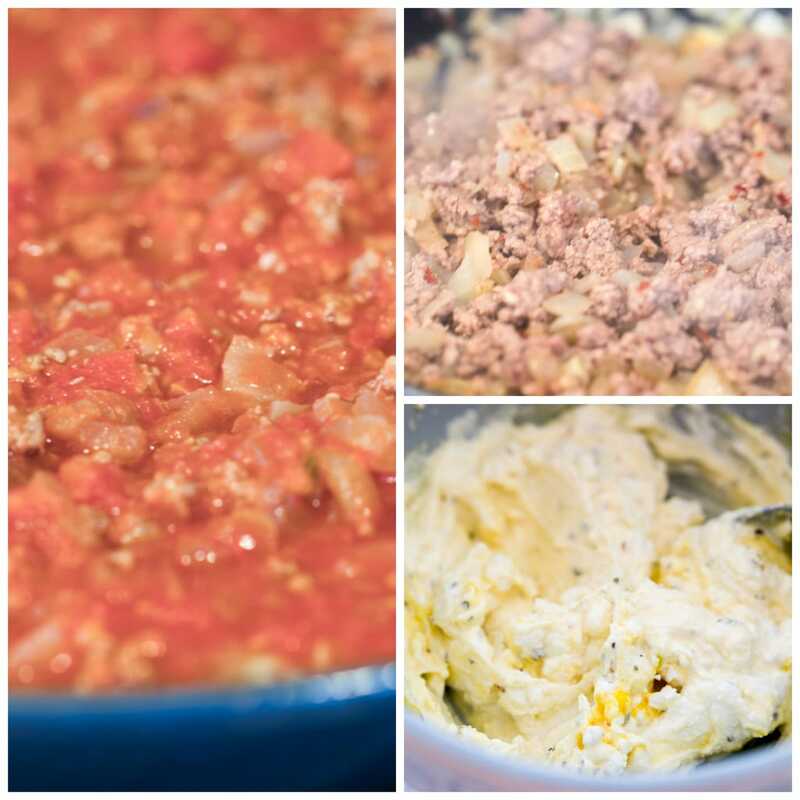 Once you have the technique of skillet lasagna down, the options are endless and you can make all kinds of swaps and versions. I honestly feel like it’s going to take a lot to get me to make a traditional lasagna again. I mean, there’s definitely something to be said for a slow-cooked bolognese sauce and handmade noodles, but unless it’s a Sunday afternoon and I’m snowed in, I don’t usually have time for that. This Greek skillet lasagna can be made after a busy workday during the week. Bonus points for the fact that this lasagna is perfect for carb-loading after (or before) completing a long run. 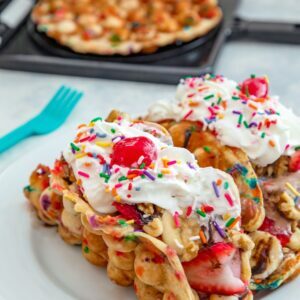 But let’s be honest, unless temperatures are ideal, I’m likely eating this while bundled up in blankets in yoga pants (sans yoga) in front of the fireplace. Cold lazy people need carbs, too… I think. Have you ever made a skillet lasagna? Heat a 10-inch cast iron skillet over medium heat and add olive oil. Once oil is shimmering, add onion and cook for 5-7 minutes, until softened and turning brown. Add garlic and red pepper flakes and cook for about 30 seconds, until fragrant. Add ground lamb to skillet and cook, breaking up with a wooden spoon, until no longer pink. Drain any excess oil. Stir crushed tomatoes into lamb mixture, along with 1/4 tsp salt, 1/4 tsp pepper, and oregano, and bring to a simmer. Cook for about 10 minutes, until sauce begins to thicken. Stir in kalamata olives and baby spinach and stir until spinach begins to wilt, about one minute. Remove meat mixture to large bowl. 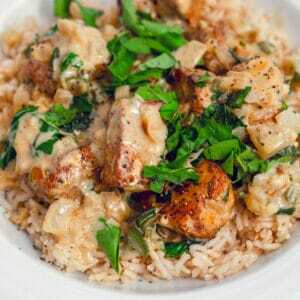 In a separate medium bowl, combine ricotta cheese, feta cheese, egg yolk, 1/4 tsp salt, and 1/4 tsp pepper. Put about 1 cup of lamb mixture on the bottom of the skillet. Shingle 6 noodle halves around the edge of the skillet. Place dollops of the ricotta/feta mixture on the noodles, using half the mixture. Top with half of the remaining meat sauce and half the mozzarella cheese and shingle the remaining 6 noodle halves around the skillet. Dollop with the remaining ricotta/feta mixture. Layer on the remaining meat sauce and remaining mozzarella. Bake for 22-25 minutes, until lasagna is bubbling around the edges and the cheese is golden. 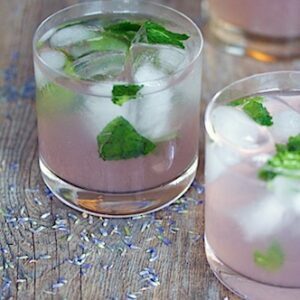 Let cool for a few minutes before sprinkling with basil and serving. 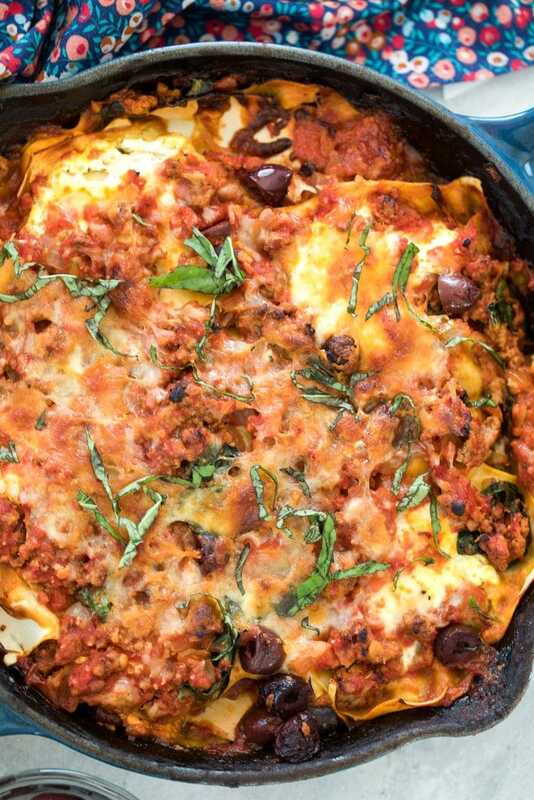 9 Responses to "Greek Skillet Lasagna"
This looks so hearty and comforting! I love Greek flavours especially feta and olives. This would be a big hit at my house. I love Barilla’s oven ready lasagna sheets. They make them in gluten free too, which is so cool! These looks AMAZING! I am having some serious dinner envy right now. Yummy! I love your recipe for skillet lasagna. I have used the Barilla lasagna sheets and they are awesome too. What a wonderfully tasty looking dish, I love the idea of swapping out the beef for lamb, great idea! This is such a great twist on a well loved classic. I love the idea of combining an Italian classic with another Mediterranean cuisine.